The summer of 2016 may be coming to a close on the calendar, but we’re still not ready to let go of all the great musical happenings around our area. 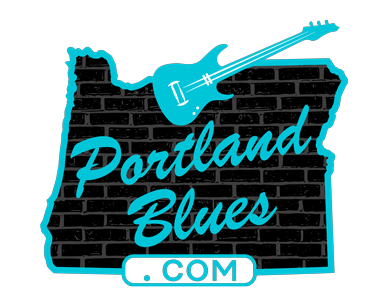 One look at the event’s calendar page lets you know right off that September is going to be a hotbed of blues goings-on and we know that the Cascade Blues Association General Membership Meeting is one of those dates you’re not going to want to miss. Opening the night we have something really special going on as one of the best piano players in the region. Steve Kerin will be bringing his authentic Louisiana boogie to The Melody Ballroom that is certain to have the dance floor break out with happy feet. Steve Kerin was born and raised in Lafayette, Louisiana, the heart of Cajun Country. He first discovered the piano at the age of four and by time he was a teenager knew that music would be his life. He has immersed himself in the piano styles of Louisiana’s legendary artists like James Booker, Fats Domino, Dr John, and Professor Longhair. Since moving to the Portland area he has brought those sounds to the front of several bands including Berthaline, Atomic Gumbo, Too Loose Cajun Band, and the Rose City Kings. Aside from playing with a wealth of bands, he has also held a long-running gig as a solo musician Thursday nights at McMenamin’s Chapel Pub where he plays the venue’s pipe organ covering a wide range of music from pop and heavy metal to jazz and movie themes. Steve and his wife Jane-Clair were also at the core of founding the Mysti Krewe of Nimbus, Portland’s own Mardi Gras Krewe. For the flavor of New Orleans and Louisiana, there’s nobody more bona fide than Steve Kerin. For the second set of the night we will be presenting Julie Amici, last year’s nominee for the “Best New Act” Muddy Award. Known for their spacious, intimate, and open sound, Dean and Julie have teamed up with Dan Gildea on guitar and Alan Jones on drums for their 2016 festival shows this summer. The addition of these two master performers have taken the band in a decidedly more powerful dimension suitable for the big stage. Alan Jones is also working as their producer for a new recording project coming out this fall. 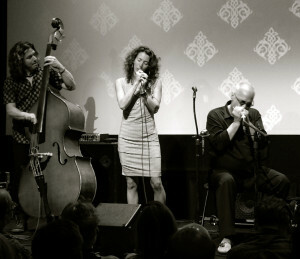 “Julie Amici” is the collaboration between Julie and Dean Mueller that started in late 2014. Much like the name is a melding of the two, the music is much the same, combining Julie’s country roots and childhood dreams of singing jazz, with Dean’s deeply rooted blues foundation. Julie’s strong yet sweet voice is reminiscent of the 50’s when female singers ruled the world of music, a time when jazz and blues co-mingled at the height of popular culture. Her repertoire combines the jazz of Billie Holiday with the soul of Nina Simone and the sophisticated country of Patsy Cline. Dean’s bass playing is rooted in the blues chops he earned playing with some of the finest blues legends in America and touring with the award winning international act, The Insomniacs. Over the last couple years the pair has performed as a duo as well as collaborated onstage with some of the finest musicians in the Northwest including Curtis Salgado, Chris Carlson, Alan Hager, Dave Fleschner, Henry Cooper, Carlton Jackson, Mark Shark, and many others. Guitarist Dan Gildea teaches jazz guitar at Portland State University and has a lengthy list of acts he has performed with in the area aside from Julie Amici, including recent collaborations and tours with Earl Thomas and Dave Fleschner. Alan Jones is one of the premier jazz artists in Portland with a long resume of places he has studied, taught and performed with, including the late Portland great Leroy Vinegar as well as leading his own sextet. The addition of Gildea and Jones to Julie Amici makes this a powerful line-up that surely speaks for itself. Between sets we will tell you about the up-coming happenings in our blues community. And we’ll hold the ever-popular free ticket drawing for CDs and tickets, plus the $1.00 winner-take-all drawing for a collection of discs put together just for the meeting. September is chock-full of great goings-on, don’t miss out on one of the best each month at the Cascade Blues Association’s membership meeting. Like every month, this is always going to be the place to hear the best in blues and catch up with good friends. Plan on being there!